Baby Blimp is a highly addictive Priority management game. Keep track of your achievements on a map that shows you your upcoming as well as your overall objectives. 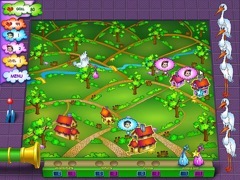 During the course of this game you will be able to upgrade your storks. You can strengthen them or increase their speed. Collect all the bonuses: the twin bonus and even the quadruplet bonus. It might even get you into the headlines of tomorrows paper!